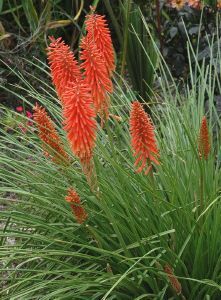 Kniphofia ‘Nancy's Red' is a compact variety of 'Red Hot Poker' or 'Torch Lily' that typically grows to 60cm tall and flowers in mid-summer. It is an upright, clump-forming and unusually rhizomatous perennial. From a basal tuft of course, sword-shaped, bluish-green linear leaves rises a succession of flower spikes featuring dense, drooping, tubular, coral-red flowers. 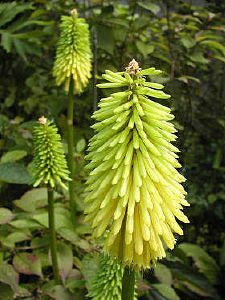 Kniphofia 'Tetbury Torch' is an unusual, medium-sized, clump forming, deciduous perennial, with deep green, grass-like leaves. Erect stems with green buds opening into apricot yellow pokers in late summer and early autumn. Prefers a moist, but well-drained soil in the sun or part shade. 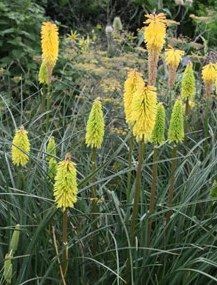 Kniphofia 'Bees Lemon' is an unusual clump forming, deciduous perennial, with deep green grass-like leaves. Erect stems with green buds opening into wide lemon-yellow flower pokers in late summer and early autumn. Prefers moist, but well drained soil in the sun or part shade. Kniphofia ‘Brimstone' is a dwarf red hot poker variety and has slender, flowering spikes surmounted by brilliant sulphur yellow flowers which appear in October and last well into winter, weather permitting. It is a good, hardy plant with rather fine leafed foliage. 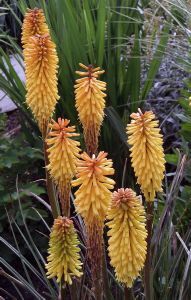 Kniphofia 'Brimstone' is a clump-forming unusual herbaceous perennial up to 60cm in height. 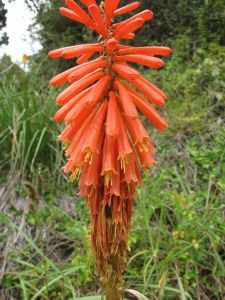 Kniphofia caulescens is a species 'Red Hot Poker' and originates in mountainous regions of Lesotho and South Africa and is possibly the hardiest of all pokers. 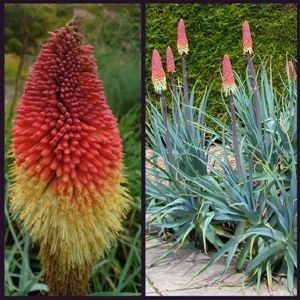 It has fabulous broad blue-grey evergreen leaves (unusual for pokers) and, late in the summer, it throws up stems of large soft-orange and yellow flower spikes. Superb in a sunny well-drained position - combines well with grasses. Eventually forms a good sized clump. This is an evergreen perennial to 1.2m.